This example illustrates how to use the IRT procedure to fit multidimensional exploratory and confirmatory IRT models. The data set that is introduced in Example 51.1 is also used here. Two more items, item9 and item10, are added to the data set. These two items are designed to measure subjects’ satisfaction with their friendships and their family life, respectively. The first table that you want to check is the “Eigenvalue” table, shown in Output 51.2.1. There are only two eigenvalues greater than 1 in this example. This result, to some extent, suggests that two factors might be enough in this example. 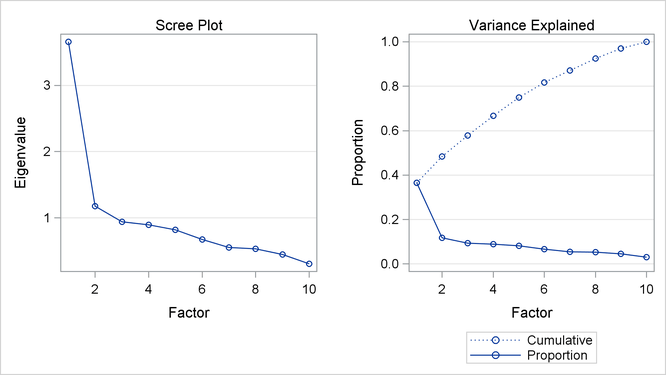 Output 51.2.2 include the scree and variance explained plots. If the optimization algorithm converges successfully, the original and rotated slope matrices are produced. The default rotation method is varimax. You can use the ROTATE= option in the PROC IRT statement to specify a different rotation method. Output 51.2.5 and Output 51.2.4 show the model fit statistics for the confirmatory model and the exploratory model, respectively. Output 51.2.6 shows the slope matrix from this confirmatory analysis. Because the number of response patterns in the data set, 500, is much lower than the total number of possible response patterns, , you cannot use Pearson’s chi-square or the likelihood ratio statistic to test the overall fit of the confirmatory model. If you have two nested models, you can still use the likelihood ratio statistic to test the difference between these two models. For illustration purposes, assume that the exploratory model and the confirmatory model are two independent models. Because the confirmatory model is nested within the exploratory model, you can use the likelihood ratio test to compare the two models. The likelihood ratio test statistic is 264.8. The degree of freedom is 9. The corresponding p-value is 0, which suggests that the difference between these two models is significant. There are many options that you can use to improve the model fit. For this example, you can try to free some of the fixed slope parameters or free the covariance between the factors.